Welcome to nuciferasolar.com and you are connected from 3.80.128.196 Enjoy! Nucifera Renewable Energy Systems is a leading manufacturer and supplier of Solar Water Heater, Solar Power Energy Products in Karnataka. Nucifera aims at helping people to cut down their electricity bills by switching to solar water heater products. 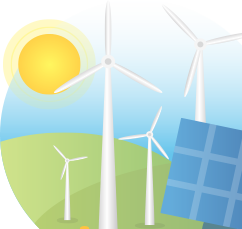 Nucifera provide best quality products and services to our people by employing latest technology in the area of solar energy. Nucifera Renewable Energy Systems has a well organized infrastructure and reputation for the most extensive and professional after sales network based in Karnataka, India. Nucifera is the leading manufacturers and supplier of solar products like solar water heater in Karnataka, solar street lights, solar inverters etc. 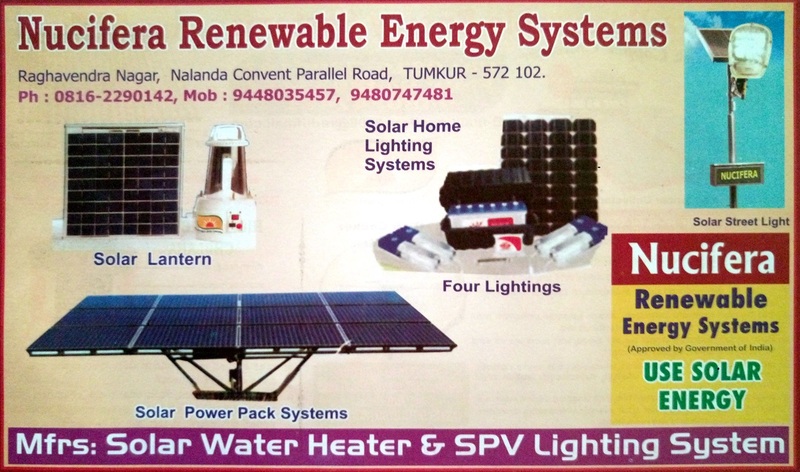 with offering a wide range of solar products at reasonable price. 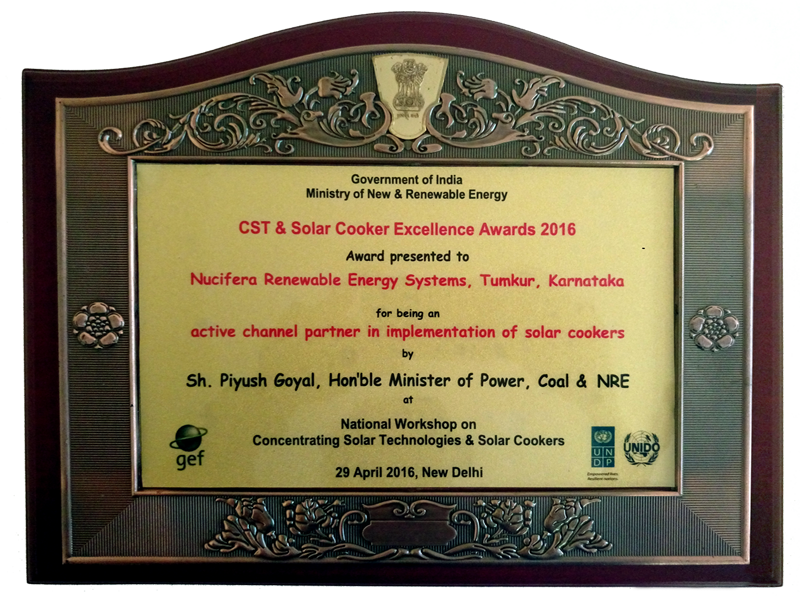 We are the Winners of CST & Solar Cooker Excellence Awards 2016. Owing to superior quality products and service offered, Nucifera Renewable Energy Systems has created a vast market in the Karnataka territory. 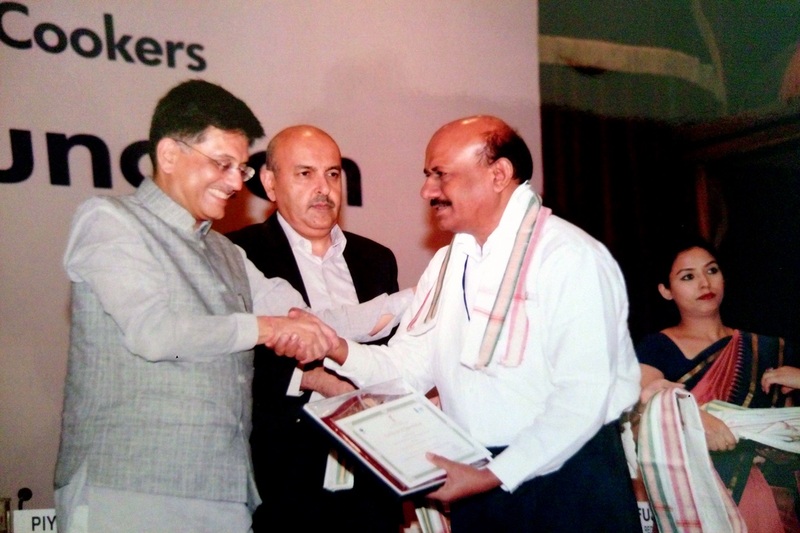 We have maintained a spotless record of constantly upgrading our products as per the changing market scenario. Copyright © 2014 - 2019 Reserved by Nucifera Solar Products, Tumakuru. This website is designed and hosted by: Digicube Solutions, INDIA. Office Address: Nucifera Renewable Energy Systems, Raghavendra Nagar, Nalanda Convent parallel Road, Tumakuru - 572103. Karnataka. INDIA.